Don’t let the word “mall” fool you into thinking it's just a place to buy new shoes. 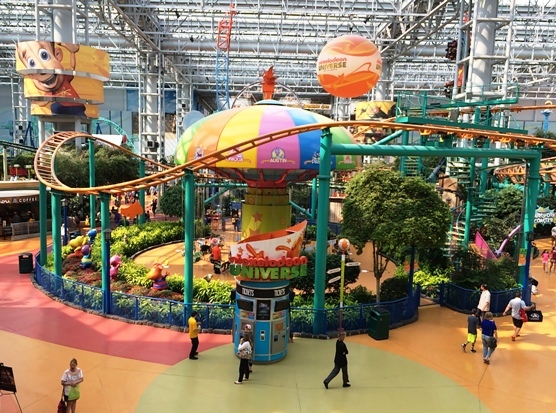 Nickelodeon Universe is the nation's largest indoor amusement park. But that’s just one of the many reasons visitors from all over the world come to this megalith. Located in Bloomington, Minnesota, Mall of America is close to the MSP airport (free shuttle service if you have a long layover or the Mall is your primary destination). Since it is just 15 minutes from downtown Minneapolis and St. Paul, Mall of America is a major tourist destination for the region. tempt you to stop and eat. And there's a Food Court, too. 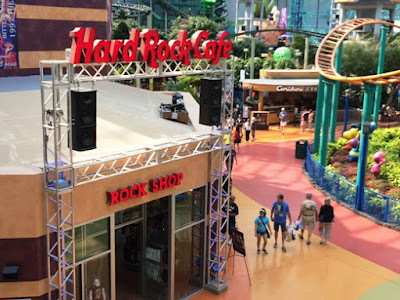 In addition to more shopping venues that you can check out in a week, there are 50 restaurants and dozens of special attractions vying for your vacation dollars. 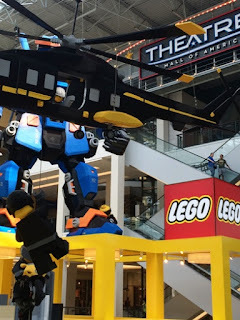 When we were in Minneapolis recently to visit family, we went straight from the airport to Mall of America. We entered the mall at Nickelodeon Universe, the country’s largest indoor theme park, which was filled with rides for all ages. A roller coaster soared to the ceiling, twisting and turning riders as it looped up and down over faux hills. Zip lines carried riders over other attractions like upside down airplane rides. Occasional happy screams from excited teens reverberated through the air, while bumper cars and a merry-go-round gave little ones their thrills. An all-day pass for adults is $30.99. The glass roof allows light and warmth in, especially in summer when air conditioning is needed for cooling. The report we heard is that no additional heat is needed in winter (and it gets really cold there) because the micro-climate created under the glass keeps air inside warm. The Lego display is a favorite of visitors. Plenty of raised beds with real flowers and greenery gave a sense of being outdoors in a fun amusement park even though it’s all enclosed. If you lived in Minnesota in the winter you’d know that outdoor activities are limited to snow and ice—and cabin fever can be a serious affliction. Mall of America is the perfect cure. Sea Life is another fun family attraction. This aquarium is located on the lower level in the same general area and requires a separate ticket, although you can see large tanks with sting rays from the main level. Charge for adults is $25.25, and for kids 3-12 it is $17.25. 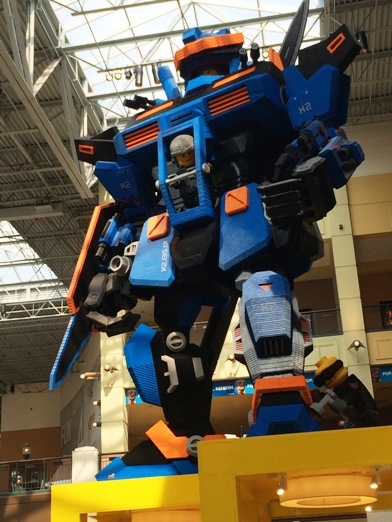 If you’re into Legos, you can find amazing gigantic figures created from the little plastic blocks on display. There are also tables set up for building to your heart’s content, so plan to stay awhile at this exhibit. If your little darlings are into American Girl, get ready with the pocketbook, as Mall of American has one of the world’s largest stores. There’s also a House of Comedy, Moose Mountain Adventure Golf ($8.99), and movie theater. Special exhibits include Star Trek, Barbie the Dreamhouse Adventure, Universe of Light, and Amazing Mirror Maze. millions of little plastic Legos. After marveling at all these attractions, we set out to do some shopping. Since we had a 16-year-old granddaughter with us, we hit some of the youth-oriented stores. But almost any store you can imagine has a presence in the Mall; some actually have two stores located at opposite ends of the Mall. You thought you could walk through the entire mall? No way, unless you’re training for a major marathon. Actually, all that trekking zapped our energy, so we took a break with burgers at Johnny Rocket’s in the food court. Maybe because our feet hurt after hours of walking around, but the only things we bought were new shoes for each of us—even better when we found out that there’s no sales tax on clothing or shoes. More than 50 hotels are located within 10 minutes of Mall of America, which is good thing because most of the shoppers appeared to be from out of town. Many hotels offer special packages and rates for tourists, which you can check out at http://www.mallofamerica.com/visit/hotels. If you’re in the area, Mall of America is a great place for a one-time visit. Maybe in 20 years you’ll want to return to see what’s new. I'm not sure I could spend all that much time in a mall, but it sounds interesting! I've never been through Minneapolis but I think it's a great idea to have a shuttle bus from the airport to the mall. It certainly sounds like there's a lot to do and see besides just shopping. I'd probably check out the Hard Rock Cafe. We love collecting their t-shirts from every destination we visit. I bet it´s a hot spot among families with kid and teenagers. I've heard so much about the Mall of America. I even have family living near it, but we've never visited. You did a great job of describing how nice it is. Perhaps, someday, I'll get to see it in person. Looks like heaven for shopping lovers, but I guess children would also be interested in all the attractions the Mall has to offer. We've been to the Mall of America. I also spent time at the theme park and the Lego Store! But, despite its size, would you believe it's not in the Top Ten Malls of the World? It looks like you could live in this mall! Thanks for all the comments. Yes, you can do much more than "shop" at Mall of America. It's huge but not as fancy or over-the-top as Mall of the Emirates. Amazing what "mall" means these days.